The last (and only) time I saw Mozart's comic opera Cosi fan tutte was 24 years ago when I was studying abroad in his lovely hometown of Salzburg, at the Marionettentheater during the week celebrating his birthday (a big deal in Salzburg). I remember nothing about it, other than that I saw it. No better way to experience it, for basically the first time in memory, than with Skylark Opera Theatre, which specializes in performing both new and classic operas in an accessible way, including performing in English. 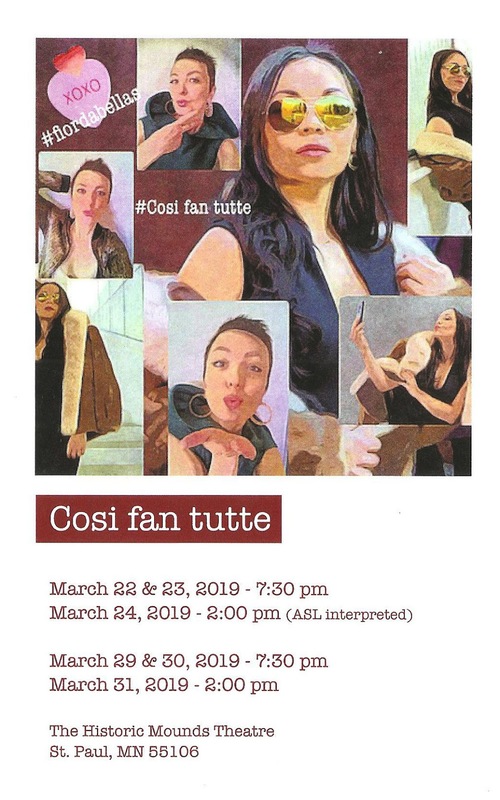 For an opera that roughly translates as "women are like that," Cosi fan tutte could be a difficult one to present in 2019. But Skylark has managed to make it modern and fun, with the jerks not getting away with the nasty tricks they play on their fiances. Performed in the small intimate space at the Historic Mounds Theatre in just over two hours, it's a fun and accessible way to experience the work of this gifted composer. The basic premise of Cosi fan tutte is that the friend of two engaged men bet them that their fiances cannot be faithful, because no woman can (I know, gross). So they develop an elaborate prank in which the men pretend to go off to war (or in this case, to build the wall), but really woo the women in disguise, swapping partners, hoping to prove them faithful but instead proving their friend right. Looking through today's lens, the women are the victims of a cruel joke, not flighty faithless females, and that's how director Robert Neu presents it. All is not forgiven here when the women find out what their so called beloveds have done. The Mounds Theatre has been rearranged to include a catwalk coming off the stage, with seating angled towards it so you can watch the action on the stage and the catwalk. This makes the performance more intimate, as the performers come right through the audience and often look and sing directly to at us. The clothing (designed by Samantha Fromm Haddow) is modern - chic outfits for the women, sharp suits for the men, and later hideous disguises that make them look like they're from an '80s hair band. The libretto (English translations by Ruth and Thomas Martin) includes modern references (text me every hour!) and the women read current magazines. All of this, and the updated ending, set the piece squarely in the present. The wonderful six-person cast sings gloriously in this space with no amplification (my favorite thing), accompanied only by the nimble-fingered Music Director Nathan Cicero on the piano, his fingers dancing over the keys in Mozart's buoyant score. 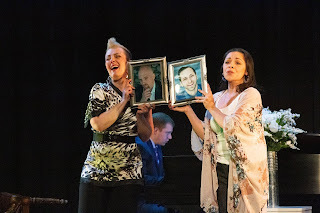 The fabulous foursome of Tess Altivero, KrissAnne Weiss, Laurent Kuehnl, and Justin Spenner sing well in all various combinations, playing up the tragicomedy. Luke Williams is a hoot as the dastardly Don Alfonso, and Siena Forest steals scenes as the women's housekeeper and Alfonso's fellow schemer. 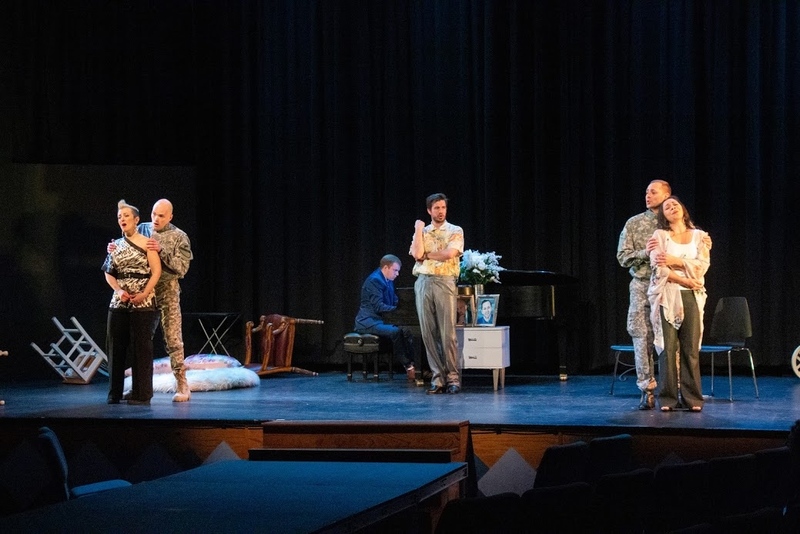 Once again, Skylark Opera Theatre proves that even 230-year old operas with questionable plots can be fun, modern, and accessible. Just four more performances remain!